You must teach people to have genuine love, as well as a good conscience and true faith. But God is the real source of wisdom and strength. Tonight at work one of my co-workers made a comment jokingly that he wasn’t a real Christian and it instantly sparked a blog idea for me: How many of us want to be “real Christians” but we are bound to the things of this world because we don’t know how to cut the strings? How many times do we stand in front of a church for one reason or another and profess to be real about our Christian walk only to walk out the doors and an hour late reattach our silly strings? How often do we sing songs of being free yet, there are strings on us that keep us from being who we are in Christ? Maybe it’s fear or distrust. Could it be we just don’t trust ourselves? The world has so much to offer. Every time we walk into a grocery store there are options. Those who watch television are droned into watching one commercial after another as companies try to entice us with the next greatest thing we need in our lives. Businesses are grabbing at our attention spans for their own gain in the world. Well, I think the next greatest thing we all need in our lives is to cut the strings. Once we begin to separate ourselves from the things of this world, the better vision we will have and the more likely we will be able to keep the strings from reattaching to us. Pinocchio struggled throughout the entire story to become a real boy, just like we struggle every day to keep ourselves pure and holy in God’s sight. 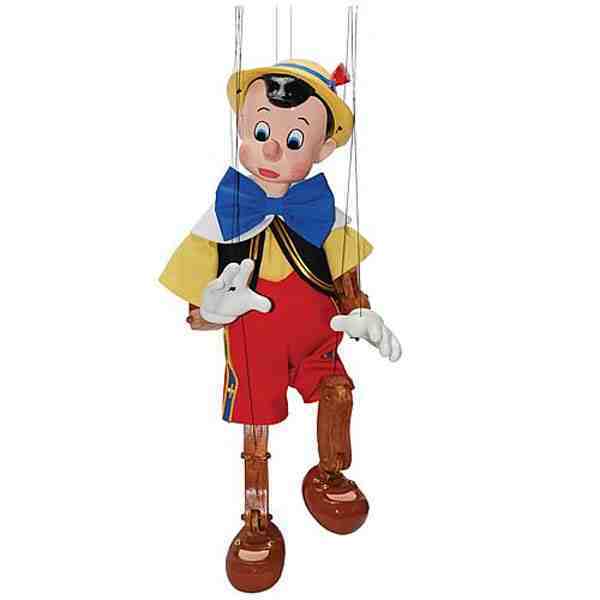 Just like Pinocchio, every turn around the corner, there is danger and we have to wrestle with our subconscious to do what is right in the situation. Will we make the right choice every time? Of course not, but we grow in our maturity each instance we do make the right decision. My take on this, Pinocchio did not have Jesus in his heart. He had no real path to follow , just a cricket, a pretty cool one at that. Maybe Jiminey Cricket represented the Holy Spirit. What if the Holy Spirit talks to people who do not know Christ, enticing them to cut their strings and follow Jesus? There is so much freedom in being able to freely move about without being tied down to this world. In the story Pinocchio does become a real boy. Do we not desire to be real Christians? Ones that are true to our word and represent Christ in all aspects of our lives? Our Creator did not design us with strings attached, why? Because He wants us to be free to choose Him. If He wanted to control us, like the world does, then maybe we would have strings and this life would just be one big puppet show. Really? I don’t think so. What are we doing in our lives to become real for Jesus? Are we separating ourselves from the sins of the world? Are we choosing every day to not become attached to what the world has to offer us instead of God’s provision? I feel that what this all boils down to is, relationship, just like Pinocchio wanted with Japedo, a real relationship. He wanted to FEEL love and be wanted. He wanted to belong and feel at home where he was. Isn’t this what we all really want? So today, I want to cut my strings. Whatever is left in me that is not of God, give me those spiritual scissors and let’s cut away! What holds us down to this world and prevents us from becoming real? Guilt. Shame. Unbelief. Unworthiness. Sin. Regrets. Unforgiveness. Pain. Were not all these things taken care of at the cross? Go get the scissors and free yourself today!